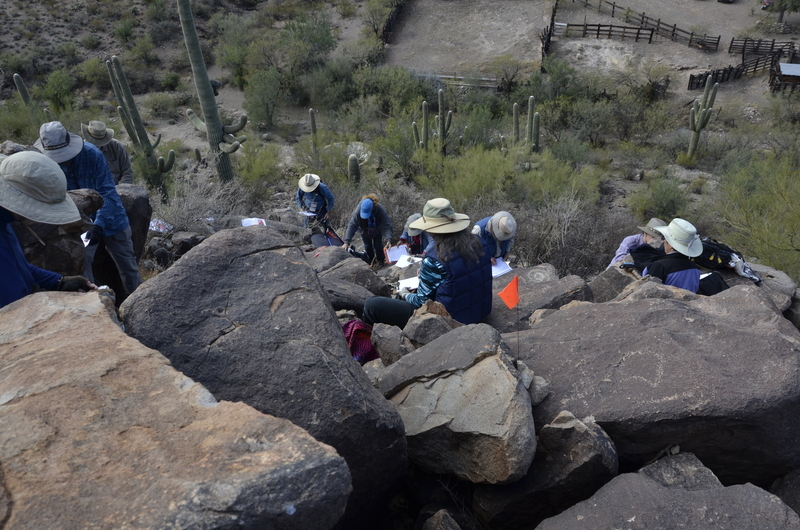 This volunteer effort seeks to record all petroglyphs, along with both grinding features and surface artifacts found in proximity to the glyphs, at the BLM’s public Cocoraque Butte site and the adjacent private Cocoraque Ranch site. The Project has been underway since January 2014 under sponsorship of BLM, with AAHS sponsorship beginning in December 2014. About 15 volunteers from the AAHS membership have been recruited and trained yearly to assist with data collection, photographs, and drawings. Work was completed on the public BLM portion of the site in March 2015. To satisfy our agreement with the Bureau of Land Management, the GPS locations and photographs of the 1,888 petroglyphs, 82 bell rocks, 69 grinding features, and 34 associated surface artifacts were provided the Bureau of Land Management’s archaeologist, on August 25, 2015. The primary purpose was to test the hypothesis that Flower World imagery would be present at Cocoraque Butte, similar to what we found previously at Sutherland Wash. In conformance with the predictions of this hypothesis, at Cocoraque we found the range of imagery characteristic of the Flower World Complex as defined by Hays-Gilpin and Hill (1999). On a percentage basis, the incidence is actually slightly higher than at Sutherland Wash and suggests that Flower World may have been a component of the belief system of the Hohokam in the Tucson area rather than being unique to Sutherland Wash. The sound produced by each of the 82 bell rocks was recorded in digital audio format and subjected to spectral analysis producing FFT plots that show the frequencies which correspond to the perceived pitch. Each bell rock produces a specific pitch with the various pitches ranging across approximately two and a half octaves. We found bell rocks are often in fairly close proximity to each another making it possible for a group of individuals to produce multi-tonal sound patterns, that is to say, music. Initial analysis of the results of our work on the BLM portion of the site in reference to the Flower World imagery was recently published in American Indian Rock Art (American Indian Rock Art, Volume 42. Ken Hedges, Editor. American Rock Art Research Association, 2016, pp. 91–105.) We are currently focused on analyzing other aspects of the petroglyph information as well as analyzing and understanding the bell rock data. A recently published piece in The Desert Leaf Desert Leaf 33(1) 2019 focuses on the bell rock research. Early in 2015, an opportunity arose to also record the portion of the site on the adjoining private Cocoraque Ranch. The Ranch includes a water source and hosts not only the oldest part of the site but also a densely and repeatedly used petroglyph site dating from archaic times through Classic Hohokam. It continued to be used probably by European and Native people up until the present. The Board gave permission to expand the project to include the portion of the site on private land in May 2015. The recording phase of this portion of Cocoraque has also been completed as of spring 2018. In the course of the project we recorded more that 11,200 glyphs making this the largest recorded site in Southern Arizona. Additionally, we found over 120 bell rocks, recording them using techniques not previously utilized in this field.